Greenhouse Gas Removal (GGR) will need to be invoked if average surface temperature is to remain under the 2oC of the Paris COP21 agreement. Deployment of global scale engineering will be required, quickly, in order to meet this target. GGR is implicit in RCP2.6 so surely the IPCC already assumes GGR technology will work? The SUGGR/SPRNGG project addresses a GGR technology appropriate to meeting the Paris COP21 target. to assist policymakers in making challenging decisions under conditions of extreme uncertainty about which competing approaches to GGR should be favoured for further research. Global climate policy is a three-legged stool requiring the simultaneous reduction of dependence on fossil fuel, increase in dependence on GHG-neutral fuels, and GGR to bridge the gap between the other two. If any of these legs falls short, climate policy will not be compatible with the UNFCCC intention of 'holding the increase in the global average temperature to well below 2oC above pre-industrial levels and pursuing efforts to limit the temperature increase to 1.5oC above pre-industrial levels,'. Non-CO2 GHGs represent about one third of the total global warming effect of human GHG emissions, and of this some 85% is produced by three gases - methane, nitrous oxide and a fluorocarbon CFC-12. Eliminating them by photocatalysis avoids the need for storage and thereby greatly reduces long term costs and risks, and also simplifies and shortens the lead time for development and deployment of the technology. In this multi-disciplinary project, chemists will investigate and optimise the choice of catalysts and their operating conditions for the elimination of the three high global warming potential (GWP) non-CO2 gases (HiGWPGs). They will also consider the manufacturing processes and costs implied in scaling the process to climatic significance. Atmospheric scientists will investigate the local and global climatic impacts of reducing the atmospheric concentration of HiGWPGs. This will include seeking confirmation of initial expectations that the climatic benefits will not be offset by interactions with the ocean, nor that any harm might be caused by 'rogue' by-products from the photocatalysis. SUTs were originally conceived as solar powered electricity generators. SUGGR/SPRNGG will repurpose this technology as a means of delivering the mass airflow necessary to process the quantity of air required to eliminate HiGWPGs at a climatically significant scale. However, SUGGR/SPRNGG also recognises that the UNFCCC's objectives are unlikely to be met without some capture and sequestration of CO2. The construction of a full scale SUT to deliver air for the photocatalytic elimination of HiGWPGs, offers a valuable experimental environment in which to further examine the at-scale capture and sequestration of atmospheric CO2. Any intervention in the global climate will have wide societal, ecological and environmental impacts, indeed, it is intended to do so as a means of averting the dangers of excessive global warming. However, this positive outcome might be accompanied by some undesirable outcomes, some of which might be anticipated and others not. Policymakers have an obligation to present and future generations to ensure that the side effects of their interventions in the global climate will not be unacceptable. Rather than a problem that will be solved, climate change is a situation that must be managed. Means must be found whereby policymakers can make sound assessments of the potential impacts, both positive and negative, of alternative policy choices and then monitor these as policies are implemented in order that they can be adapted to changing circumstances, new knowledge and evolving perceptions of different communities about what is and is not acceptable. SUGGR/SPRNGG embraces these uncertainties and in the social science and complexity science components will investigate and develop policy processes that will inform policymakers' decision making in relation to GGR. Greenhouse Gas Removal (GGR) will need to be invoked to remain under the 2oC of the Paris COP21 agreement. Deployment of global scale engineering will be required, quickly, in order to meet this target. GGR is implicit in RCP2.6 so the IPCC already assumes GGR technology will work. The SPRNGG project addresses a GGR technology appropriate to meeting this target. It is estimated that GGR of at least 3GtCeq/yr and possibly more than 20GtCeq/yr will be required depending on how soon fossil fuel emissions peak, how quickly they decline, and their eventual residual value. GGR at climatically relevant scale requires sufficient airflow given the extreme dilution of the greenhouse gases (GHGs). 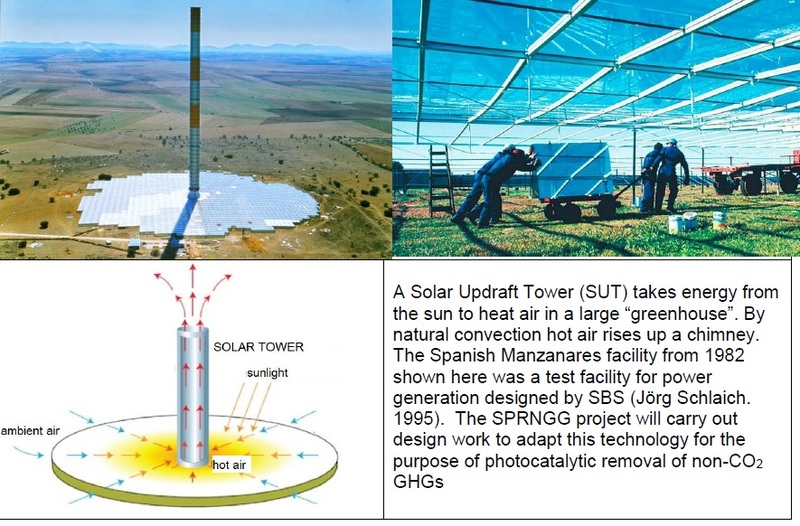 The SPRNGG proposal uses solar updraft towers (SUTs) to generate the necessary mass airflow driven only by solar energy. 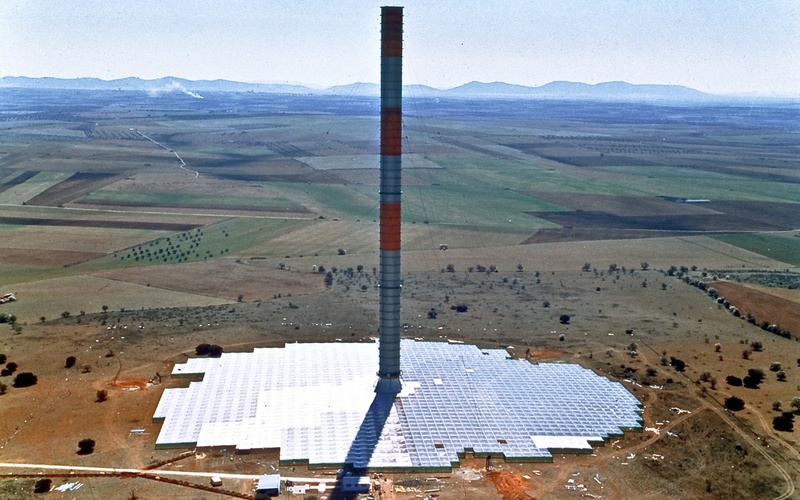 Located in hot arid deserts, these comprise large chimneys (500m to 1km or more in height and 100m to 200m in diameter) at the centre of a large solar collector (a greenhouse about 7km in diameter). The sun heats the air which exits through the chimney. Depending on a range of operating variables, a SUT could draw 50km3 or more per day. 10,000 such devices, with a combined footprint of the order of 0.5Mkm2 could process the entire atmosphere in less than 30 years, and would have the theoretical capacity to access more than sufficient GHG to accommodate the UNFCCC's targets. The photocatalyst enables us to harness sunlight to promote the destruction of CH4, N2O and the fluorocarbon. A major feature of the SUT+PC process is that no capture or sequestration is necessary, thus greatly reducing costs and risks, and therefore the lead time to deployment. These installations have virtually no moving parts and should therefore have a working life well in excess of 100 years, sufficient to secure their economic justification. They will also be almost maintenance free save for the cleaning of the solar collector and the periodic refreshing of the photocatalytic surfaces. Attractive as the elimination of HiGWPGs may be, it may not be enough to secure the UNFCCC target without the removal of some atmospheric CO2. Moreover, only the reduction of atmospheric CO2 will address ocean acidification. The mass airflow through a SUT can equally be used to capture CO2, however the processes of direct air capture and sequestration of CO2 require further research to reach multiple gigatonne per annum scale. Depending on operating conditions, 1,000 SUTs could access some 70GtCO2/yr, requiring only 50% efficiency to capture as much carbon as is currently being emitted. This project will scope the research needed to assess SUTs as the front end of climate scale CO2 capture and sequestration. RQ1. How can SUTs and PC be combined to eliminate HiGWPGs at climate relevant scale without risking undesirable unintended consequences? RQ2. How can SUTs built to eliminate HiGWPGs be used as experimental environments to develop the direct air capture and sequestration of atmospheric CO2 in climatically relevant amounts? RQ3. How can alternative GGR approaches best be broadly grouped in order to inform meaningful comparisons between? RQ4. To what extent would the SUT+PC GGR approach interact with other social and natural systems, and how does this differ from other GGR approaches? RQ5. How can the CLCA methodology be adapted to account for the intended climatic effects of different broadly-grouped GGR approaches and their long term wider socio-political, economic, ecological, environmental and ethical impacts, both expected and unexpected, that affect their viability as feasible approaches in the 'real world', recognising that climate change is a situation to be managed rather than a problem to be solved and that policy, including GGR, will develop heuristically? The core theory of SUTs as a source of solar powered electricity generation was established in the 1980s using a large experimental prototype. Since then further theoretical work has been undertaken to improve their performance for power generation. In addition to repurposing SUTs as a delivery mechanism for a giant photocatalytic reactor (GPR), this project will also consider ways in which they could be used as an experimental environment for the research and development of CO2 capture and sequestration, and in particular investigate ways in which, using abundant solar power, it could be sequestered in solid form as a means of avoiding the liquefaction of CO2 for subterranean storage, thereby ensuring more permanent and lower risk storage, and easier monitoring, reporting and verification of amounts sequestered, a factor likely to be of considerable importance in the geopolitics of GGR. 3. a CLCA methodology designed for comparability across diverse GGR approaches with complex impacts on globally extensive social and natural systems over extended periods, illustrated by its application to the long term at-scale deployment of multiple SUT+PC installations for the elimination of climatically relevant amounts of HiGWGPs.